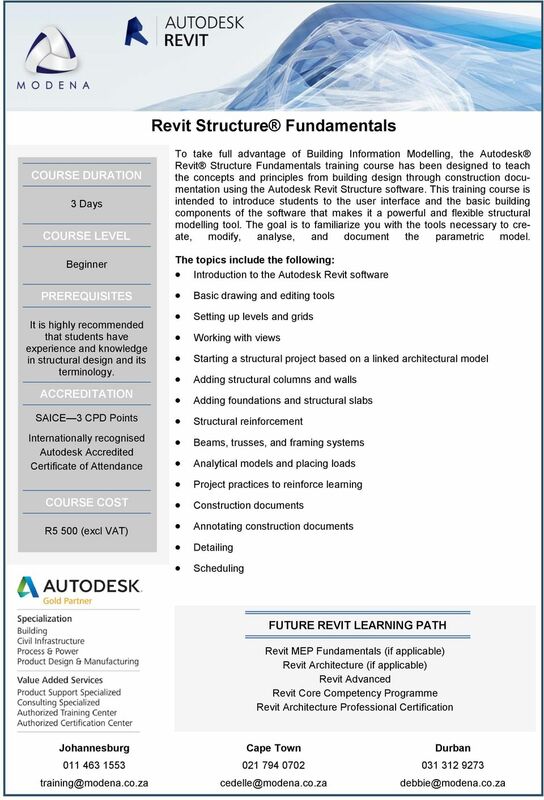 Download "Autodesk Revit LEARNING PATH BUILDING DESIGN SUITE"
6 Revit Advanced (Continued) 4 Days Advanced Fundamentals, Revit Structure Fundamentals, or Revit MEP Fundamentals training course. Knowledge of basic techniques is assumed, ie creating standard element, copying and moving elements, and creating and working with views, creating walls, roofs, and other objects, copying and moving objects. 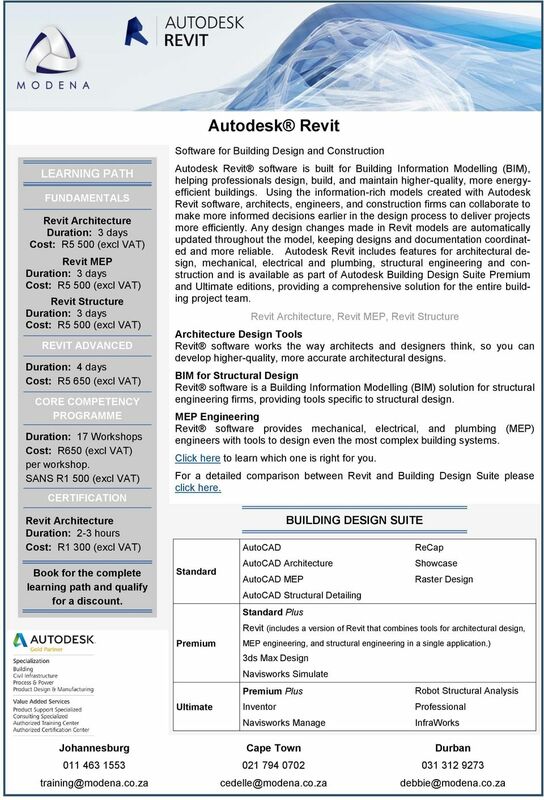 R5 650 (excl VAT) Collaboration Tools - to enable students who have a basic knowledge of Revit to increase their productivity while working with other people on a team, either in the same firm or other firms as well as with other disciplines. It also covers linking Autodesk Revit files and linking or importing other CAD files. Topics include: Set up project phasing, Create and display a variety of design options, Use groups, Link Autodesk Revit files, Use multi-discipline coordination including Copy/Monitor and Coordination Review, Import and export vector and raster files including exporting Autodesk Revit models for energy analysis, Understand, use, and set up worksets. 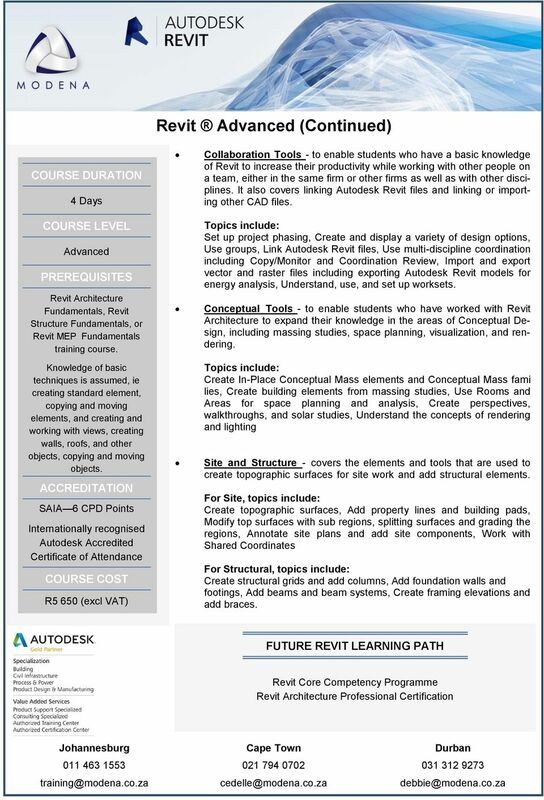 Conceptual Tools - to enable students who have worked with Revit Architecture to expand their knowledge in the areas of Conceptual Design, including massing studies, space planning, visualization, and rendering. Topics include: Create In-Place Conceptual Mass elements and Conceptual Mass fami lies, Create building elements from massing studies, Use Rooms and Areas for space planning and analysis, Create perspectives, walkthroughs, and solar studies, Understand the concepts of rendering and lighting Site and Structure - covers the elements and tools that are used to create topographic surfaces for site work and add structural elements. For Site, topics include: Create topographic surfaces, Add property lines and building pads, Modify top surfaces with sub regions, splitting surfaces and grading the regions, Annotate site plans and add site components, Work with Shared Coordinates For Structural, topics include: Create structural grids and add columns, Add foundation walls and footings, Add beams and beam systems, Create framing elevations and add braces. 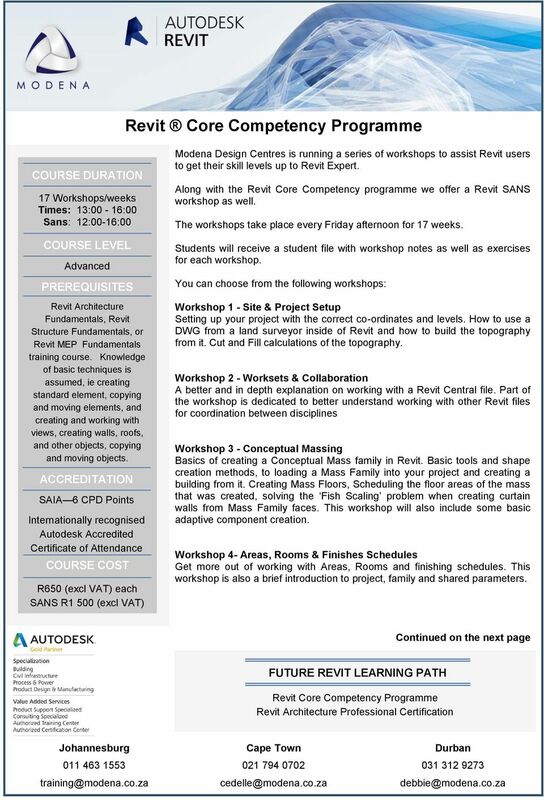 9 Revit Core Competency Programme (Continued) 17 Workshops/weeks Times: 13:00-16:00 Sans: 12:00-16:00 Advanced Fundamentals, Revit Structure Fundamentals, or Revit MEP Fundamentals training course. Knowledge of basic techniques is assumed, ie creating standard element, copying and moving elements, and creating and working with views, creating walls, roofs, and other objects, copying and moving objects. R650 (excl VAT) each SANS R1 500 (excl VAT) Workshop 12 - Family Creation 3 Family creation 3 will focus on how to create a simple timber truss system, as well as, a more complex steel truss system. The simple timber truss system will focus on parameters such as length and angle in order to create a flexible truss family. The more complex steel truss system will focus array parameters driven by the length and pitch, as well as trigonometric formulas which allow the family to remain flexible. Workshop 13 - Door Schedules This workshop is dedicated to understanding the workflows for door schedules specific to an architectural application. Workshop 14 - Design Option & Phasing An advanced look at additional features in Revit related to options and phasing for architectural applications. 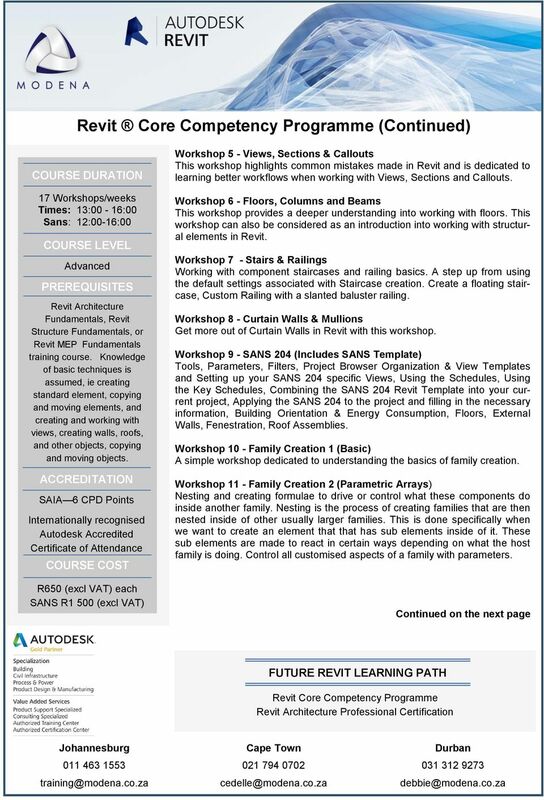 Workshop 15 - Annotation Families Families that can be created and used as legend or table views of information that needs to be displayed in this format for your project. This will include a Key Plan for the scenario of multiple buildings on a site. The family will indicate to the contractor or relevant consultants which building the sheet is referring to on the site. The second family will be the step-by-step creation of a Refuse Area Calculation family. This will be a family that will indicate to the plan examiner what the size of the refuse area needs to be depending on the use of the building. Lastly we will create a table for showing the schedule of rights and the required parking spaces, how many have been supplied and how many are still required. Workshop 16 Rendering This workshop focuses on how work with Render settings and it s dependants in Revit. 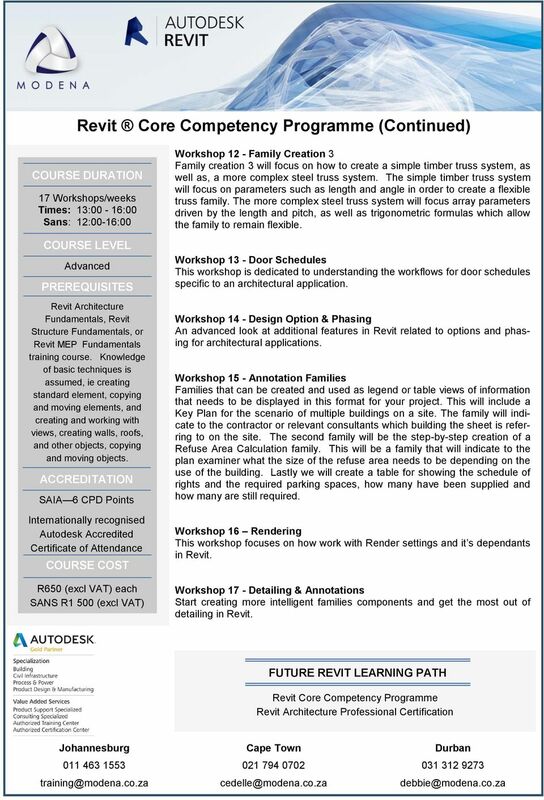 Workshop 17 - Detailing & Annotations Start creating more intelligent families components and get the most out of detailing in Revit. The use of BIM in plumbing projects creates deeper project knowledge, delivers a more robust product, and can reduce total project costs. The Shorten AutoCAD the road solution for mechanical, electrical, to done. and plumbing engineering. AutoCAD AutoCAD. 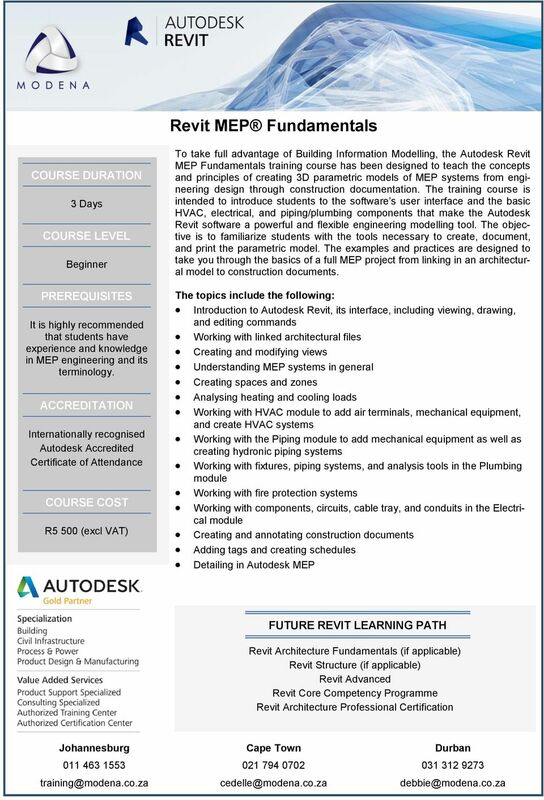 Autodesk Revit Architecture. Design without compromise. The Future Is Now! Building Information Modeling (BIM) Thomas Korman, Ph.D. P.E. Worksharing is a design method that allows multiple team members to work on the same project model at the same time. 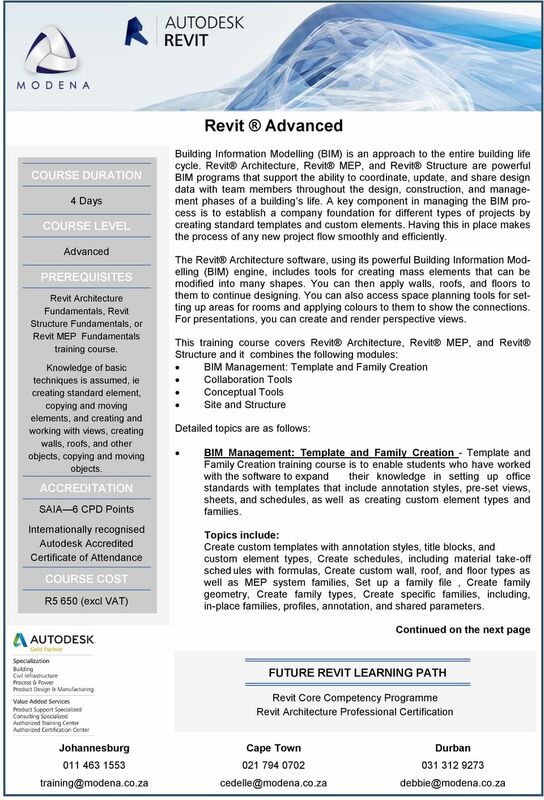 Coordinating and Sharing Information with Revit Architecture and Revit Structure Best Practices! Design without compromise. 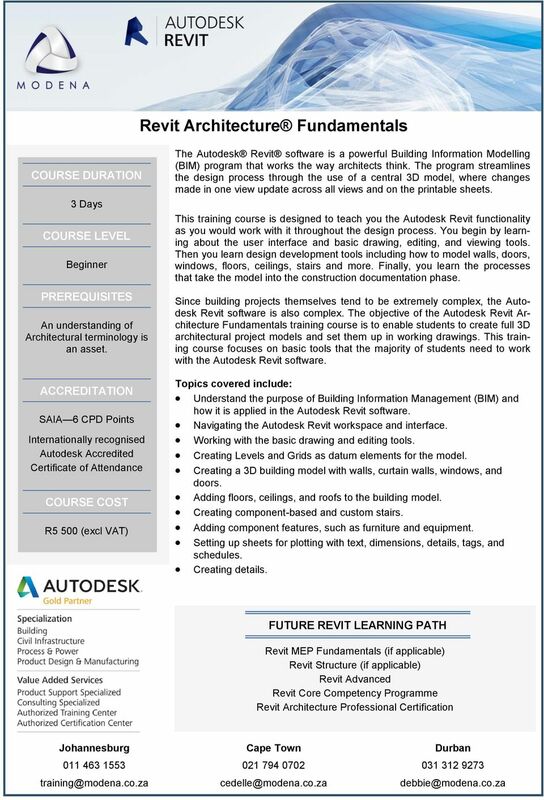 Autodesk Revit Architecture 2010 BIM Simply a Better Way of Working Deliver projects faster, more economically, and with enhanced potential for reduced environmental impact. Autodesk Revit Keynotes Made Simple: Adding Custom Keynotes to Your Construction Documents Tony Crawford CAD-1, Inc.
and 2010: rprise Increasingly, must ation, es, partners, s intelligence. 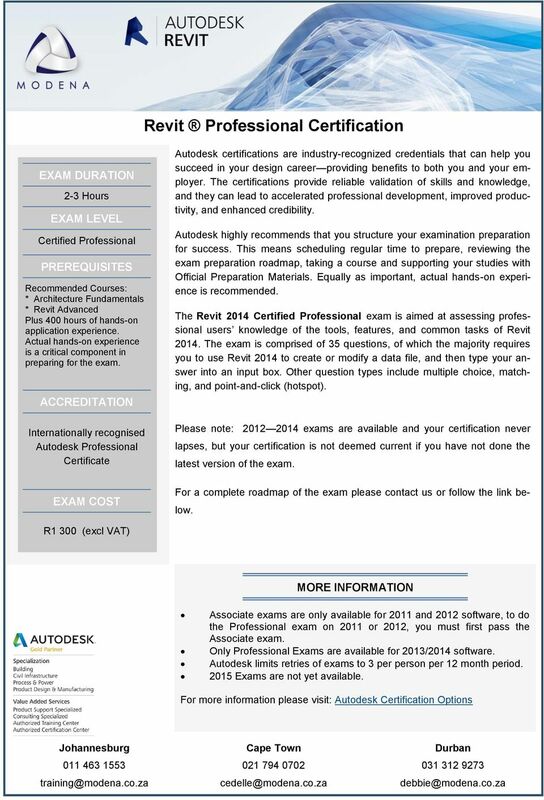 Autodesk Robot Structural Analysis Professional 2010. Break it down before you build it up.